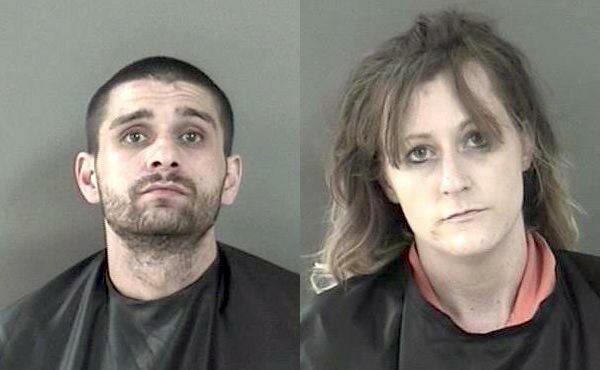 Couple found with drugs and child in vehicle at Vero Beach lot. VERO BEACH – The Vero Beach Police Department responded to a suspicious vehicle earlier this morning parked next to the baseball field at 1750 20th Avenue. Police spotted a silver colored SUV backed into the lot next to field in Vero Beach with two adults and one child. Officers said all three occupants were sleeping with the windows open. The adults said they just drove into town from Arizona and parked for the night because they didn’t want to wake up their family. While observing the vehicle, officers noticed it was very dirty with trash piled everywhere. The child was sleeping in the car seat completely unclothed, sweaty and sitting in urine. Police then found two crack pipes and two syringes laying out in the open inside the vehicle. A spoon with residue and a wire mesh was located near the driver’s seat along with two bottles of pills. The male, identified as 30-year-old Jared Michael Alfonso, said the drug paraphernalia was his. He had an active warrant in St. Lucie County for driving with a suspended license and for criminal use of personal identification/theft. The female, identified as 31-year-old Amanda Nicole Kobeck, had a warrant out for her arrest from Arizona for probation violation for drugs. Police Florida Department of Children and Families. The child was then turned over to their custody. Alfonso has been arrested 10 times in Indian River County. Kobeck has been arrested 12 times in Indian River County.